Transcriptomic profiling of colorectal cancer (CRC) has led to the identification of four consensus molecular subtypes (CMS1 to 4) that have prognostic value in stage II and III disease. More recently, the Colorectal Cancer Intrinsic Subtypes (CRIS) classification system has helped to define the biology specific to the epithelial component of colorectal tumors; however, the clinical value of these classification systems in the prediction of response to standard-of-care adjuvant chemotherapy remains unknown. Using samples from four European sites, we assembled a novel cohort of patients with stage II and III CRC (n = 156 samples) and performed transcriptomic profiling and targeted sequencing and generated a tissue microarray to enable integrated multiomics analyses. We also accessed data from two published cohorts of patients with stage II and III CRC: GSE39582 and GSE14333 (n = 479 and n = 185 samples, respectively). The epithelial-rich CMS2 subtype of CRC benefitted significantly from treatment with adjuvant chemotherapy in both stage II and III disease (P = .02 and P < .001, respectively), whereas the CMS3 subtype significantly benefitted in stage III only (P= .001). After CRIS substratification of CMS2, we observed that only the CRIS-C subtype significantly benefitted from treatment with adjuvant chemotherapy in stage II and III disease (P = .0081 and P < .001, respectively), whereas the CRIS-D subtype significantly benefitted in stage III only (P = .0034). We also observed that CRIS-C patients with low levels of CD8+ tumor-infiltrating lymphocytes were most at risk for relapse in both stage II and III disease (log-rank P = .0031; hazard ratio, 12.18 [95% CI, 1.51 to 98.58]). Patient stratification using a combination of transcriptional subtyping and CD8 immunohistochemistry analyses is capable of identifying patients with poor prognostic stage II and III disease who benefit from adjuvant standard-of-care chemotherapy. These findings are particularly relevant for patients with stage II disease, where the overall benefit of adjuvant chemotherapy is marginal. EphA2 expression is a key driver of migration and invasion and a poor prognostic marker in colorectal cancer. Clin Cancer Res. 2015 Aug 17. pii: clincanres.0603.2015. PURPOSE: EphA2, a member of the Eph receptor tyrosine kinases family, is an important regulator of tumour initiation, neo-vascularization and metastasis in a wide range of epithelial and mesenchymal cancers, however its role in colorectal cancer (CRC) recurrence and progression is unclear. RESULTS: Colorectal tumours displayed significantly higher expression levels of EphA2 compared with matched normal tissue, which positively correlated with high CD44 and Lgr5 expression levels. Moreover, high EphA2 mRNA and protein expression were found to be associated with poor overall survival in stage II/III CRC tissues, in both univariate and multivariate analyses. Pre-clinically, we found that EphA2 was highly expressed in KRASMT CRC cells and that EphA2 levels are regulated by the KRAS-driven MAPK and RalGDS-RalA pathways. Moreover, EphA2 levels were elevated in several invasive daughter cell lines and down-regulation of EphA2 using RNAi or recombinant EFNA1, suppressed migration and invasion of KRASMT CRC cells. CONCLUSIONS: These data show that EpHA2 is a poor prognostic marker in stage II/III CRC, which may be due to its ability to promote cell migration and invasion, providing support for the further investigation of EphA2 as a novel prognostic biomarker and therapeutic target. Purpose: Activating mutations in the BRAF oncogene are found in 8% to 15% of colorectal cancer patients and have been associated with poor survival. In contrast with BRAF-mutant (MT) melanoma, inhibition of the MAPK pathway is ineffective in the majority of BRAFMT colorectal cancer patients. Therefore, identification of novel therapies for BRAFMT colorectal cancer is urgently needed. Results: Increased c-MET-STAT3 signaling was identified as a novel adaptive resistance mechanism to MEK inhibitors (MEKi) in BRAFMT colorectal cancer models in vitro and in vivo. Moreover, MEKi treatment resulted in acute increases in transcription of the endogenous caspase-8 inhibitor c-FLIPL in BRAFMT cells, but not in BRAFWT cells, and inhibition of STAT3 activity abrogated MEKi-induced c-FLIPL expression. In addition, treatment with c-FLIP–specific siRNA or HDAC inhibitors abrogated MEKi-induced upregulation of c-FLIPL expression and resulted in significant increases in MEKi-induced cell death in BRAFMT colorectal cancer cells. Notably, combined HDAC inhibitor/MEKi treatment resulted in dramatically attenuated tumor growth in BRAFMT xenografts. Conclusions: Our findings indicate that c-MET/STAT3-dependent upregulation of c-FLIPL expression is an important escape mechanism following MEKi treatment in BRAFMT colorectal cancer. Thus, combinations of MEKi with inhibitors of c-MET or c-FLIP (e.g., HDAC inhibitors) could be potential novel treatment strategies for BRAFMT colorectal cancer. Bioorg Med Chem Lett. 2015 Oct 1;25(19):4287-92. Mutations in the Ras-pathway occur in 40-45% of colorectal cancer patients and these are refractory to treatment with anti-EGFR-targeted therapies. With this in mind, we have studied novel guanidinium-based compounds with demonstrated ability to inhibit protein kinases. We have performed docking studies with several proteins involved in the Ras-pathway and evaluated 3,4′-bis-guanidinium derivatives as inhibitors of B-Raf. Compound 3, the most potent in this series, demonstrated strong cytotoxicity in (WT)B-Raf colorectal cancer cells and also cells with (V600E)B-Raf mutations. Cell death was induced by apoptosis, detected by cleavage of PARP. Compound 3 also potently inhibited ERK1/2 signalling, inhibited EGFR activation, as well as Src, STAT3 and AKT phosphorylation. Mechanistically, compound 3 did not inhibit ATP binding to B-Raf, but direct assay of B-Raf activity was inhibited in vitro. Summarizing, we have identified a novel B-Raf type-III inhibitor that exhibits potent cellular cytotoxicity. Ong CW, Chong PY, McArt DG, Chan JY, Tan HT, Kumar AP, Chung MC, Clément MV, Soong R, Van Schaeybroeck S, Waugh DJ, Johnston PG, Dunne PD, Salto-Tellez M.
Colorectal cancer (CRC) is the second leading cause of cancer-related deaths in the Western world. It is becoming increasingly clear that CRC is a diverse disease, as exemplified by the identification of subgroups of CRC tumours that are driven by distinct biology. Recently, a number of studies have begun to define panels of diagnostically relevant markers to align patients into individual subgroups in an attempt to give information on prognosis and treatment response. We examined the immunohistochemical expression profile of 18 markers, each representing a putative role in cancer development, in 493 primary colorectal carcinomas using tissue microarrays. Through unsupervised clustering in stage II cancers, we identified two cluster groups that are broadly defined by inflammatory or immune-related factors (CD3, CD8, COX-2 and FOXP3) and stem-like factors (CD44, LGR5, SOX2, OCT4). The expression of the stem-like group markers was associated with a significantly worse prognosis compared to cases with lower expression. In addition, patients classified in the stem-like subgroup displayed a trend towards a benefit from adjuvant treatment. The biologically relevant and poor prognostic stem-like group could also be identified in early stage I cancers, suggesting a potential opportunity for the identification of aggressive tumors at a very early stage of the disease. Is precision medicine the route to a healthy world? In their letter, John Coote and Michael Joyner argue that “Although precision medicine will almost certainly be used in niche applications, if widely implemented, it could be a distraction from low-cost and effective population-wide interventions and policies”, adding, “We believe precision medicine is not the route to a healthy world and instead urge a renewed and increased focus on public health and prevention”. 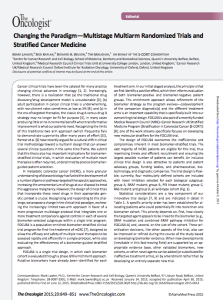 Changing the Paradigm-Multistage Multiarm Randomized Trials and Stratified Cancer Medicine. Lawler M, Kaplan R, Wilson RH, Maughan T; S-CORT Consortium. Silencing the voice of scientific reason. In view of the central role of science in underpinning advances in cancer research and cancer care, the decision by the new President of the European Commission Jean-Claude Juncker to sack Anne Glover, the EU Chief Scientific Adviser, is baffling. As detailed in this journal, Glover, a noted cell biologist from the University of Aberdeen (Aberdeen, UK), was appointed Chief Scientific Adviser by previous President José Manuel Barroso. It would seem that her intelligence, integrity, and insight are the very qualities that led to her position being axed. Abstract: PIK3CA, which encodes the p110α catalytic subunit of PI3Kα, is one of the most frequently altered oncogenes in colon cancer (CC), but its prognostic value is still a matter of debate. Few reports have addressed the association between PIK3CA mutations and survival and their results are controversial. In the present study, we aimed to clarify the prognostic impact of PIK3CA mutations in stage I-III CC according to mismatch repair status. Fresh frozen tissue samples from two independent cohorts with a total of 826 patients who underwent curative surgical resection of CC were analyzed for microsatellite instability and screened for activating point mutations in exon 9 and 20 of PIK3CA by direct sequencing. Overall, 693 tumors (84%) exhibited microsatellite stability (MSS) and 113 samples (14%) harbored PIK3CA mutation. In the retrospective training cohort (n = 433), patients with PIK3CA-mutated MSS tumors (n = 47) experienced a significant increased 5-year relapse-free interval compared with PIK3CA wild-type MSS tumors (n = 319) in univariate analysis (94% vs. 68%, Log-rank P = 0. 0003) and in multivariate analysis (HR = 0.12; 95% confidence interval, 0.029-0.48; P = 0.0027). In the prospective validation cohort (n = 393), the favorable prognostic impact of PIK3CA mutations in MSS tumors (n = 327) was confirmed (83% vs. 67%, Log-rank P = 0.04). Our study showed that PIK3CA mutations are associated with a good prognosis in patients with MSS stage I-III CC. STRATEGIC-1: A multiple-lines, randomized, open-label GERCOR phase III study in patients with unresectable wild-type RAS metastatic colorectal cancer. Chibaudel B, Bonnetain F, Tournigand C, de Larauze MH, de Gramont A, Laurent-Puig P, Paget J, Hadengue A, Notelet D, Benetkiewicz M, André T, de Gramont A.
BMC Cancer. 2015 Jul 4;15:496. Background The management of unresectable metastatic colorectal cancer (mCRC) is a comprehensive treatment strategy involving several lines of therapy, maintenance, salvage surgery, and treatment-free intervals. Besides chemotherapy (fluoropyrimidine, oxaliplatin, irinotecan), molecular-targeted agents such as anti-angiogenic agents (bevacizumab, aflibercept, regorafenib) and anti-epidermal growth factor receptor agents (cetuximab, panitumumab) have become available. Ultimately, given the increasing cost of new active compounds, new strategy trials are needed to define the optimal use and the best sequencing of these agents. Such new clinical trials require alternative endpoints that can capture the effect of several treatment lines and be measured earlier than overall survival to help shorten the duration and reduce the size and cost of trials. Methods/Design STRATEGIC-1 is an international, open-label, randomized, multicenter phase III trial designed to determine an optimally personalized treatment sequence of the available treatment modalities in patients with unresectable RAS wild-type mCRC. Two standard treatment strategies are compared: first-line FOLFIRI-cetuximab, followed by oxaliplatin-based second-line chemotherapy with bevacizumab (Arm A) vs. first-line OPTIMOX-bevacizumab, followed by irinotecan-based second-line chemotherapy with bevacizumab, and by an anti-epidermal growth factor receptor monoclonal antibody with or without irinotecan as third-line treatment (Arm B). The primary endpoint is duration of disease control. A total of 500 patients will be randomized in a 1:1 ratio to one of the two treatment strategies. Discussion The STRATEGIC-1 trial is designed to give global information on the therapeutic sequences in patients with unresectable RAS wild-type mCRC that in turn is likely to have a significant impact on the management of this patient population. The trial is open for inclusion since August 2013. Trial registration STRATEGIC-1 is registered at Clinicaltrials.gov: NCT01910610, 23 July, 2013. STRATEGIC-1 is registered at EudraCT-No. : 2013-001928-19, 25 April, 2013. Expression of pEGFR and pAKT as response-predictive biomarkers for RAS wild-type patients to anti-EGFR monoclonal antibodies in metastatic colorectal cancers. Harlé A, Salleron J, Perkins G, Pilati C, Blons H, Laurent-Puig P, Merlin JL. Br J Cancer. 2015 Aug 11;113(4):680-5. Background RAS wild-type (RASw/t) tumours have been associated with better outcomes in patients with metastatic colorectal cancer (mCRC) treated with anti-EGFR monoclonal antibodies (mAb). We investigated the expression of EGFR downstream proteins under their active phosphorylated forms as potential markers in response to these patients. Methods One-hundred tumour samples were collected from patients with mCRC refractory to FOLFOX and/or FOLFIRI and treated by a combination of chemotherapy with anti-EGFR mAb. The outcomes were measured on response evaluation criteria in solid tumour (RECIST), progression-free survival (PFS) and overall survival (OS). All samples were assessed for RAS and BRAF mutations, and the key phosphorylated proteins of EGFR downstream signalling were quantitatively analysed using the BioPlex Protein array. Results Among the 60 RASw/t patients, 45.0% achieved a complete or partial response when treated with anti-EGFR mAb. Expression of pAKT, pERK1/2 and pMEK1 was significantly lower in RASw/t patients (P=0.0246; P=0.004; P=0.0110, respectively). The response rate was significantly higher for RASw/t patients who express pEGFR and pAKT (P=0.0258; P=0.0277, respectively). Conclusions Overexpression of pEGFR and pAKT may predict the response rate in RASw/t patients treated with anti-EGFR mAb. On the basis of our results, we hypothesise that the association of anti-EGFR mAb and anti-AKT therapies could be of interest. 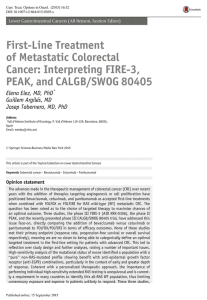 First-Line Treatment of Metastatic Colorectal Cancer: Interpreting FIRE-3, PEAK, and CALGB/SWOG 80405. Elez E, Argilés G, Tabernero J.
Curr Treat Options Oncol. 2015 Nov;16(11):52. 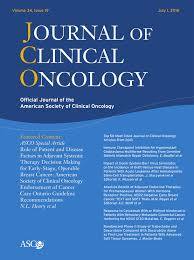 A Randomized Phase II/III Study of Dalotuzumab in Combination With Cetuximab and Irinotecan in Chemorefractory, KRAS Wild-Type, Metastatic Colorectal Cancer. J Natl Cancer Inst. 2015 Sep 23;107(12). Background Insulin-like growth factor type 1 receptor (IGF-1R) mediates resistance to epidermal growth factor receptor (EGFR) inhibition and may represent a therapeutic target. We conducted a multicenter, randomized, double blind, phase II/III trial of dalotuzumab, an anti-IGF-1R monoclonal antibody, with standard therapy in chemo-refractory, KRAS wild-type metastatic colorectal cancer. Methods Eligible patients were randomly assigned to dalotuzumab 10mg/kg weekly (arm A), dalotuzumab 7.5mg/kg every alternate week (arm B), or placebo (arm C) in combination with cetuximab and irinotecan. Primary endpoints were progression-free survival (PFS) and overall survival (OS). Secondary endpoints included exploratory biomarker analyses. All statistical tests were two-sided. Results The trial was prematurely discontinued for futility after 344 eligible KRAS wild-type patients were included in the primary efficacy population (arm A = 116, arm B = 117, arm C = 111). Median PFS was 3.9 months in arm A (hazard ratio [HR] = 1.33, 95% confidence interval [CI] = 0.98 to 1.83, P = .07) and 5.4 months in arm B (HR = 1.13, 95% CI = 0.83 to 1.55, P = .44) compared with 5.6 months in arm C. Median OS was 10.8 months in arm A (HR = 1.41, 95% CI = 0.99 to 2.00, P = .06) and 11.6 months in arm B (HR = 1.26, 95% CI = 0.89 to 1.79, P = .18) compared with 14.0 months in arm C. Grade 3 or higher asthenia and hyperglycaemia occurred more frequently with dalotuzumab compared with placebo. In exploratory biomarker analyses, patients with high IGF-1 mRNA tumors in arm A had numerically better PFS (5.6 vs 3.6 months, HR = 0.59, 95% CI = 0.28 to 1.23, P = .16) and OS (17.9 vs 9.4 months, HR = 0.67, 95% CI = 0.31 to 1.45, P = .31) compared with those with high IGF-1 mRNA tumors in arm C. In contrast, in arm C high IGF-1 mRNA expression predicted lower response rate (17.6% vs 37.3%, P = .04), shorter PFS (3.6 vs 6.6 months, HR = 2.15, 95% CI = 1.15 to 4.02, P = .02), and shorter OS (9.4 vs 15.5 months, HR = 2.42, 95% CI = 1.21 to 4.82, P = .01). Conclusions Adding dalotuzumab to irinotecan and cetuximab was feasible but did not improve survival outcome. IGF-1R ligands are promising biomarkers for differential response to anti-EGFR and anti-IGF-1R therapies. First-in-Man Dose-Escalation Study of the Selective BRAF Inhibitor RG7256 in Patients with BRAF V600-Mutated Advanced Solid Tumors. Dienstmann R, Lassen U, Cebon J, Desai J, Brown MP, Evers S, Su F, Zhang W, Boisserie F, Lestini B, Schostack K, Meresse V, Tabernero J.
BRAF mutations are a validated target for cancer therapy. 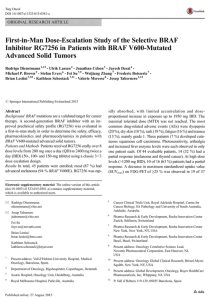 A second-generation BRAF inhibitor with an improved preclinical safety profile (RG7256) was evaluated in a first-in-man study in order to determine the safety, efficacy, pharmacokinetics and pharmacodynamics in patients with BRAF V600-mutated advanced solid tumors. PATIENTS AND METHODS: Patients received RG7256 orally over 8 dose levels from 200 mg once a day (QD) to 2400 mg twice a day (BID) (50-, 100- and 150-mg tablets) using a classic 3 + 3 dose escalation design. RESULTS: In total, 45 patients were enrolled; most (87 %) had advanced melanoma (94 % BRAF V600E). RG7256 was rapidly absorbed, with limited accumulation and dose-proportional increase in exposure up to 1950 mg BID. The maximal tolerated dose (MTD) was not reached. The most common drug-related adverse events (AEs) were dyspepsia (20 %), dry skin (18 %), rash (18 %), fatigue (16 %) and nausea (13 %), mainly grade 1. Three patients (7 %) developed cutaneous squamous cell carcinoma. Photosensitivity, arthralgia and increased liver enzyme levels were each observed in only one patient each. Of 44 evaluable patients, 14 (32 %) had a partial response (melanoma and thyroid cancer). At high dose levels (>1200 mg BID), 10 of 16 (63 %) patients had a partial response. A decrease in maximum standardized uptake value (SUVmax) on FDG-PET of ≥25 % was observed in 19 of 37 patients. On-treatment reductions in pERK were documented in eight of ten paired tumor samples. CONCLUSIONS: RG7256 has a favorable safety profile compared to other BRAF inhibitors while maintaining clinical activity, and MTD was not reached. The excessive pill burden needed to provide the desired exposure, and thus concerns about patient compliance, limited further development of this agent. Study Identifier: ClinicalTrials.gov (NCT01143753). Tumour mutational status is an important determinant of the response of metastatic colorectal cancer to targeted treatments. However, the genotype of the tissue obtained at the time of diagnosis might not accurately represent tumour genotype after multiple lines of treatment. This retrospective exploratory analysis investigated the clinical activity of regorafenib in biomarker subgroups of the CORRECT study population defined by tumour mutational status or plasma protein levels. METHODS We used BEAMing technology to identify KRAS, PIK3CA, and BRAF mutations in DNA obtained from the plasma of 503 patients with metastatic colorectal cancer who enrolled in the CORRECT trial. We quantified total human genomic DNA isolated from plasma samples for 503 patients using a modified version of human long interspersed nuclear element-1 (LINE-1) quantitive real-time PCR. We also measured the concentration of 15 proteins of interest-angiopoietin 2, interleukin 6, interleukin 8, placental growth factor, soluble TIE-1, soluble VEGFR1, VEGF-A, VEGF-C, VEGF-D, VEGF-A isoform 121, bone morphogenetic protein 7, macrophage colony-stimulating factor, stromal cell-derived factor-1, tissue inhibitor of metalloproteinase 2, and von Willebrand factor-in plasma samples from 611 patients. We did correlative analyses of overall survival and progression-free survival in patient subgroups based on mutational status, circulating DNA concentration, and protein concentrations. The CORRECT trial was registered with ClinicalTrials.gov, number NCT01103323. INTERPRETATION BEAMing of circulating DNA could be a viable approach for non-invasive analysis of tumour genotype in real time and for the identification of potentially clinically relevant mutations that are not detected in archival tissue. Additionally, the results show that regorafenib seems to be consistently associated with a clinical benefit in a range of patient subgroups based on mutational status and protein biomarker concentrations. Zimmer L, Barlesi F, Martinez-Garcia M, Dieras V, Schellens JH, Spano JP, Middleton MR, Calvo E, Paz-Ares 9, Larkin J, Pacey S, Venturi M, Kraeber-Bodéré F, Tessier JJ, Eberhardt WE, Paques M, Guarin E, Meresse V, Soria JC. Clin Cancer Res. 2014 Aug 15;20(16):4251-61. This phase I expansion study assessed safety, pharmacodynamic effects, and antitumor activity of RO4987655, a pure MEK inhibitor, in selected patients with advanced solid tumor. We undertook a multicenter phase I two-part study (dose escalation and cohort expansion). Here, we present the part 2 expansion that included melanoma, non-small cell lung cancer (NSCLC), and colorectal cancer with oral RO4987655 administered continuously at recommended doses of 8.5 mg twice daily until progressive disease (PD). Sequential tumor sampling investigated multiple markers of pathway activation/tumor effects, including ERK phosphorylation and Ki-67 expression. BRAF and KRAS testing were implemented as selection criteria and broader tumor mutational analysis added. Ninety-five patients received RO4987655, including 18 BRAF-mutant melanoma, 23 BRAF wild-type melanoma, 24 KRAS-mutant NSCLC, and 30 KRAS-mutant colorectal cancer. Most frequent adverse events were rash, acneiform dermatitis, and gastrointestinal disorders, mostly grade 1/2. Four (24%) of 17 BRAF-mutated melanoma had partial response as did four (20%) of 20 BRAF wild-type melanoma and two (11%) of 18 KRAS-mutant NSCLC. All KRAS-mutant colorectal cancer developed PD. Paired tumor biopsies demonstrated reduced ERK phosphorylation among all cohorts but significant differences among cohorts in Ki-67 modulation. Sixty-nine percent showed a decrease in fluorodeoxyglucose uptake between baseline and day 15. Detailed mutational profiling confirmed RAS/RAF screening and identified additional aberrations (NRAS/non-BRAF melanomas; PIK3CA/KRAS colorectal cancer) without therapeutic implications. Safety profile of RO4987655 was comparable with other MEK inhibitors. Single-agent activity was observed in all entities except colorectal cancer. Evidence of target modulation and early biologic activity was shown among all indications independent of mutational status. Clin Cancer Res; 20(16); 4251-61. ©2014 AACR. Background: Combined MET and BRAF inhibition showed clinical benefit in a patient with rectal cancer carrying BRAFV600E and MET amplification. However, after 4 months, acquired resistance emerged and the patient deceased shortly after disease progression. The mechanism of resistance to this drug combination is unknown. Kwak EL, Ahronian LG, Siravegna G, Mussolin B, Godfrey JT, Clark JW, Blaszkowsky LS, Ryan DP, Lennerz JK, Iafrate AJ, Bardelli A, Hong TS, Corcoran RB. MET inhibition is effective in some MET-amplified esophagogastric cancer (EGC) patients, but understanding acquired and de novo resistance mechanisms will be critical to improving therapy. We identified KRAS mutation as a novel cause of acquired resistance in a patient after a two-year response to MET inhibitor. We also observed that 40-50% of MET-amplified EGC patients harbor co-amplification of HER2 and/or EGFR concurrently in the same tumor cells, which can drive de novo resistance. One patient with concurrent MET and HER2-amplification was refractory to HER2 blockade, but responded to combined MET/HER2 inhibition. We also found striking heterogeneity in MET-amplification between distinct metastatic lesions and primary tumors in individual EGC patients. In these patients, MET inhibition led to mixed responses and disease progression through outgrowth of non-MET-amplified clones, which could be monitored in circulating tumor DNA. Thus, receptor co-amplification and molecular heterogeneity may be key drivers of clinical resistance in MET-amplified EGC. Nat Commun. 2015 Apr 30;6:7002. We evaluated the influence of RAS mutation status on the treatment effect of panitumumab in a prospective-retrospective analysis of a randomized, multicenter phase 3 study of panitumumab plus fluorouracil, leucovorin, and irinotecan (FOLFIRI) versus FOLFIRI alone as second-line therapy in patients with metastatic colorectal cancer (mCRC; ClinicalTrials.gov, NCT0039183). EXPERIMENTAL DESIGN Outcomes were from the study’s primary analysis. RAS mutations beyond KRAS exon 2 (KRAS exons 3, 4; NRAS exons 2, 3, 4; BRAF exon 15) were detected by bidirectional Sanger sequencing in wild-type KRAS exon 2 tumor specimens. Progression-free survival (PFS) and overall survival (OS) were coprimary endpoints. RESULTS The RAS ascertainment rate was 85%; 18% of wild-type KRAS exon 2 tumors harbored other RAS mutations. For PFS and OS, the hazard ratio for panitumumab plus FOLFIRI versus FOLFIRI alone more strongly favored panitumumab in the wild-type RAS population than in the wild-type KRAS exon 2 population (PFS HR, 0.70 [95%CI=0.54‒0.91];P=0.007 versus 0.73 [95%CI=0.59-0.90];P=0.004; OS HR, 0.81 [95%CI=0.63‒1.03];P=0.08 versus 0.85 [95%CI=0.70‒1.04];P=0.12). Patients with RAS mutations were unlikely to benefit from panitumumab. Among RAS wild-type patients, the objective response rate was 41% in the panitumumab-FOLFIRI group versus 10% in the FOLFIRI group. CONCLUSIONS Patients with RAS mutations were unlikely to benefit from panitumumab-FOLFIRI and the benefit-risk of panitumumab-FOLFIRI was improved in the wild-type RAS population compared to the wild-type KRAS exon 2 population. These findings support RAS testing for patients with mCRC. Early clinical trials conducted primarily in Japan have shown that TAS-102, an oral agent that combines trifluridine and tipiracil hydrochloride, was effective in the treatment of refractory colorectal cancer. We conducted a phase 3 trial to further assess the efficacy and safety of TAS-102 in a global population of such patients. METHODS In this double-blind study, we randomly assigned 800 patients, in a 2:1 ratio, to receive TAS-102 or placebo. The primary end point was overall survival. RESULTS The median overall survival improved from 5.3 months with placebo to 7.1 months with TAS-102, and the hazard ratio for death in the TAS-102 group versus the placebo group was 0.68 (95% confidence interval [CI], 0.58 to 0.81; P<0.001). The most frequently observed clinically significant adverse events associated with TAS-102 were neutropenia, which occurred in 38% of those treated, and leukopenia, which occurred in 21%; 4% of the patients who received TAS-102 had febrile neutropenia, and one death related to TAS-102 was reported. The median time to worsening performance status (a change in Eastern Cooperative Oncology Group performance status [on a scale of 0 to 5, with 0 indicating no symptoms and higher numbers indicating increasing degrees of disability] from 0 or 1 to 2 or more) was 5.7 months with TAS-102 versus 4.0 months with placebo (hazard ratio, 0.66; 95% CI, 0.56 to 0.78; P<0.001). CONCLUSIONS In patients with refractory colorectal cancer, TAS-102, as compared with placebo, was associated with a significant improvement in overall survival. Van Der Steen N, Pauwels P, Gil-Bazo I, Castañon E, Raez L, Cappuzzo F, Rolfo C.
Cancers (Basel). 2015 Mar 25;7(2):556-73. In the last decade, the tyrosine kinase receptor cMET, together with its ligand hepatocyte growth factor (HGF), has become a target in non-small cell lung cancer (NSCLC). Signalization via cMET stimulates several oncological processes amongst which are cell motility, invasion and metastasis. It also confers resistance against several currently used targeted therapies, e.g., epidermal growth factor receptor (EGFR) inhibitors. In this review, we will discuss the basic structure of cMET and the most important signaling pathways. We will also look into aberrations in the signaling and the effects thereof in cancer growth, with the focus on NSCLC. Finally, we will discuss the role of cMET as resistance mechanism. Hutchinson RA, Adams RA, McArt DG, Salto-Tellez M, Jasani B, Hamilton PW. J Transl Med. 2015 Jul 7;13:217. The treatment of cancer is becoming more precise, targeting specific oncogenic drivers with targeted molecular therapies. The epidermal growth factor receptor has been found to be over-expressed in a multitude of solid tumours. Immunohistochemistry is widely used in the fields of diagnostic and personalised medicine to localise and visualise disease specific proteins. To date the clinical utility of epidermal growth factor receptor immunohistochemistry in determining monoclonal antibody efficacy has remained somewhat inconclusive. The lack of an agreed reproducible scoring criteria for epidermal growth factor receptor immunohistochemistry has, in various clinical trials yielded conflicting results as to the use of epidermal growth factor receptor immunohistochemistry assay as a companion diagnostic. This has resulted in this test being removed from the licence for the drug panitumumab and not performed in clinical practice for cetuximab. In this review we explore the reasons behind this with a particular emphasis on colorectal cancer, and to suggest a way of resolving the situation through improving the precision of epidermal growth factor receptor immunohistochemistry with quantitative image analysis of digitised images complemented with companion molecular morphological techniques such as in situ hybridisation and section based gene mutation analysis.